Get like totally fabulous savings on Disney's latest Blu-ray! 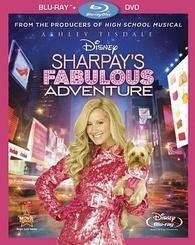 Here's another offer, this time to save $8 on 'Sharpay's Fabulous Adventure' starring Ashley Tisdale available on Blu-ray on April 19. Click this link to access to the page where you can print out your coupon valid at participating retailers. The offer is available in-store only in the U.S. and Canada and the coupon expires on April 26.